I told him that we were from Wisconsin. "Hey, I'm a cheesehead, too! Come gather around, Cheeseheads, and I will tell you a story." (He pointed to the statue) "You see this next guy? That's Rene Gagnon from New Hampshire. If you took Rene's helmet off at the moment this photo was taken and looked in the webbing of that helmet, you would find a photograph ... a photograph of his girlfriend. Rene put that in there for protection because he was scared. He was 18 years old. Boys won the battle of Iwo Jima. Boys. Not old men. 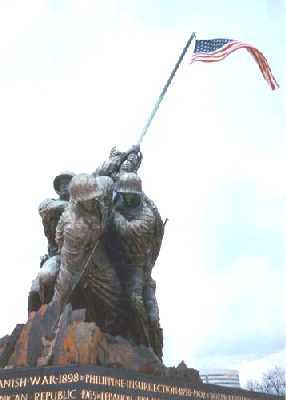 "The last guy on this side of the statue is Ira Hayes, a Pima Indian from Arizona. Ira Hayes walked off Iwo Jima. He went into the White House with my dad. President Truman told him, 'You're a hero.' He told reporters, 'How can I feel like a hero when 250 of my buddies hit the island with me and only 27 of us walked off alive?' So you take your class at school, 250 of you spending a year together having fun, doing everything together. Then all 250 of you hit the beach, but only 27 of your classmates walk off alive. That was Ira Hayes. He had images of horror in his mind. Ira Hayes died dead drunk, face down at the age of 32 ... ten years after this picture was taken. "The next guy, going around the statue, is Franklin Sousley from Hilltop, Kentucky. A fun-lovin' hillbilly boy. His best friend, who is now 70, told me, 'Yeah, you know, we took two cows up on the porch of the Hilltop General Store. Then we strung wire across the stairs so the cows couldn't get down. Then we fed them Epsom salts. Those cows crapped all night.' Yes, he was a fun-lovin' hillbilly boy. Franklin died on Iwo Jima at the age of 19. When the telegram came to tell his mother that he was dead, it went to the Hilltop General Store. A barefoot boy ran that telegram up to his mother's farm. The neighbors could hear her scream all night and into the morning. The neighbors lived a quarter of a mile away. "You see, my dad didn't see himself as a hero. Everyone thinks these guys are heroes, 'cause they are in a photo and a monument. My dad knew better. He was a medic. John Bradley from Wisconsin was a caregiver. In Iwo Jima he probably held over 200 boys as they died. And when boys died in Iwo Jima, they writhed and screamed in pain. We need to remember that God created this vast and glorious world for us to live in, freely, but also at great sacrifice. Let us never forget from the revolutionary War to the Gulf War and all the wars in-between that sacrifice was made for our freedom. Remember to pray praises for this great country of ours and also pray for those still in murderous unrest around the world. STOP and thank God for being alive at someone else's sacrifice. God Bless. America is hit once again with a major tragedy. 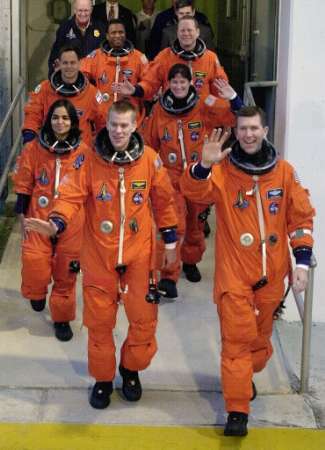 The space shuttle Columbia, with seven astronauts aboard, broke up as it descended over central Texas Saturday, Feb.1 2003, toward a planned landing at Kennedy Space Center in Florida. Residents as far east as Shreveport, Louisiana, reported seeing and feeling an apparent explosion. And if you'll pause a moment, I will share with you my plan. "This flight goes straight to Heaven, fear not, for I am near." Yes....this trip is something special, it's one that God will man. Heaven's Great Space Center needs some special help up there. The Master has now summoned and is asking us to share." Not a one was unprepared, not a one afraid to try. Is the 'changing of the pilots,' for you're traveling on with me." Rest assured they're here beside Me and I have them in My care." Encompasses the entire globe, The Universe of Man." I selected them some time ago, forgetting not the cost. Though it's little comfort, your loss is Heaven's gain." On 9-11-01, America suffered a terrorist attack on the World Trade Center Twin Towers and the Pentagon. 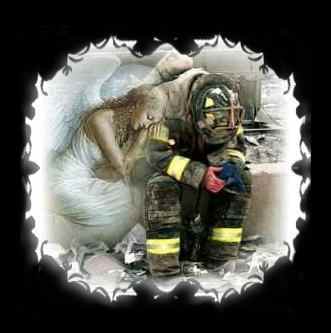 Our hearts went out to all of the families and friends of the victims, our firefighters and heroes of that terrible day, and still do. Some of us may want to forget what happened that day, but most of us can't forget! Nor should we, in my opinion. I know it definitly opened my eyes to America's vulnerability which I hadn't really thought about until then. It made me realize life is way too short and made me much closer to my family & friends. I hate to admit it, but it's a shame that it takes such a thing to make you stop and think! I know I'm guilty! Please visit this site for some excellent tribute pages! !